What happens if the ceremony is delayed? Should I invite the officiant to the rehearsal dinner or reception? What happens if the officiant gets sick or has an emergency? What is the difference between a "personalized ceremony" and "custom vows"? Are we required to attend premarital counseling? You seem pretty open to ideas; is there anything you won't do? What are the marriage license requirements? Although it happens rarely, there are times a couple may have to cancel their contract for any number of reasons. Written notice of cancellation is required. Communication via email or regular post is acceptable notification. The contracted deposit is considered non-refundable as it guarantees the date and time of the ceremony and thus Joyful Promises declines any other business for that date and time while the contract is active. When a ceremony is cancelled, the date is cleared and Joyful Promises will again speak to other couples who inquire about that same date and general time period. In the event the date is rebooked: the original deposit from the Couple who cancelled will be refunded. The re-booking does not need to be for the exact time of the original wedding. Simply rebooking a ceremony for the same day may suffice. In the event the date is not rebooked: In these instances, Joyful Promises will take several factors into consideration regarding a refund of the deposit. The factors include, but are not limited to, the demand for the time period in question and how far in advance Joyful Promises has had the opportunity to rebook. (For example, Joyful Promises may reserve the right to keep a deposit if we have had to turn down several requests while the contract was active, but do not have adequate time to rebook after the cancellation. On the other hand, Joyful Promises may refund a deposit if we have had time to receive subsequent inquiries after a cancellation even though they did not result in a booking.) Joyful Promises does reserve the right to deduct incurred expenses from any deposit. Joyful Promises reserves the right to bill a late charge for ceremonies that begin more than thirty minutes after the planned start time. In the very unlikely event an extremely excessive delay results in the officiant’s schedule making it impossible for him/her to remain on-site, the Couple is still responsible for the full officiating fee and may incur an additional late charge dependent upon the length of time the officiant waited before having to leave. The Couple will be sent an invoice for the late charge payable within thirty days per the fee schedule below. While that is a lovely gesture, it is completely unnecessary, and chances are the officiant would decline anyway. Please understand that while your wedding or other ceremony is the most important day of your lives, it is a professional commitment for your officiant who, having performed your beautiful ceremony, is most likely looking forward to getting back to hearth and home and into comfy clothes. Joyful Promises has three ordained officiants; one primary and two for backup. We only book one ceremony at any given time, so that the other two are available if needed should the primary be unable to perform her duties. We also have other officiants as additional resources. To paraphrase the famous theatrical expression, "Your show will go on". You are probably familiar with the traditional wedding vows: "Do you take <Name> to be your lawfully wedded wife/husband, to have and to hold from this day forward, to honor and cherish, for better or worse, for richer or poorer, in sickness and in health, forsaking all others, until death do you part." That's really all that's necessary to be married. By including additional rituals such as the Unity Candle, Blending of Sands, Memory Candle, or other traditions at your request, along with the appropriate language that goes with them, we are "personalizing" your ceremony. On the other hand, if the traditonal vows don't resonate with you and you want us to work with you to create vows that are truly unique to you, those are "customized" vows because we are starting from scratch and writing something totally new. The short answer is, "That depends." Check out the Rehearsals page for more information. 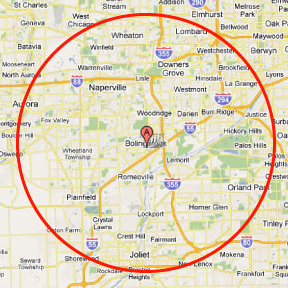 We currently serve the communities of Bolingbrook, Romeoville, Lemont, Woodridge, Lisle, Naperville, Joliet, Plainfield, Lombard, Hinsdale, Glen Ellyn, Aurora, Darien, Oak Brook, and Downers Grove ― basically anywhere within a 20-mile radius of Bolingbrook, IL.. View service area map. .However, we are also willing to consider other locations on a case-by-case basis. Are we required to attend premarital counseling with you? The short answer is, "No". I am not qualified to do counseling. However, I do recommend that you attend a few counseling sessions on your own, just to make sure you have similar expectations of marriage before you enter into yours. Please note: I may choose not to provide officiant services for any couple I believe are getting married for the wrong reasons, or that the relationship is abusive, or in some other way makes me feel that performing their wedding ceremony is not in their best interest. In most cases, I will reach this conclusion during our first meeting and won't even enter into a contract with them. However, if I determine at a later date that I am uncomfortable performing such a ceremony, I will void the contract and refund all payments made to date in full. Put simply, Yes, there is. We do have limits! Check out our What I Won't Do page for details. The license must be issued by the county in which the ceremony will take place (not the county in which you live). You will receive the license on the day you apply. Once issued, there is a one-day waiting period before you can get married. The license is valid for 60 days. You will need to pay a fee (determined by the county). Check the county clerk's office for the amount and forms of payment they accept. You will need a photo ID and possibly your certified birth certificate. If you have been married before, you must provide proof of how that previous marriage ended (divorce decree or death certificate). No physical exam or blood test is required. You must be at least 18 years of age to get married without parental permission. You can get married at 16 with parental permission. You cannot get married under the age of 16. When the ceremony is over, the officiant will sign the license and submit it via certified mail or FedEx to the county clerk's office within three (3) days of the ceremony. You can obtain a certified copy from the county clerk's office, usually within 30 days. © 2010-2019 Joyful Promises. All Rights Reserved.